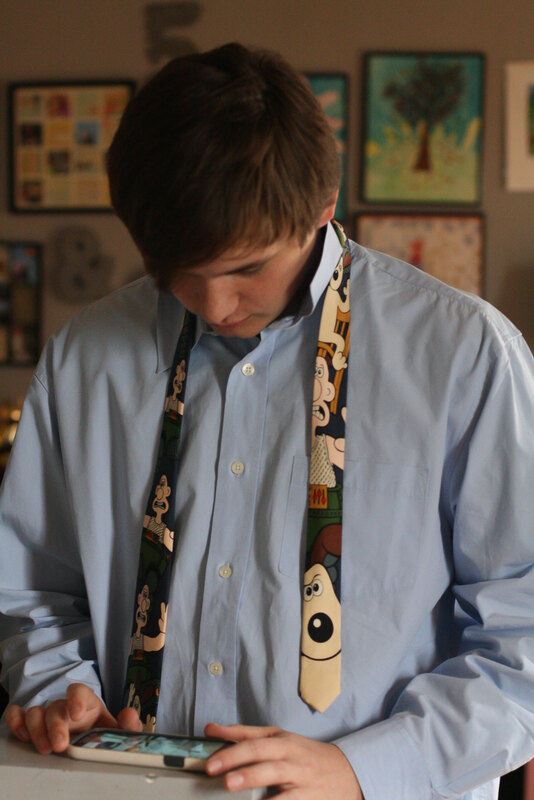 on Saturday afternoon when jarred was getting ready for prom we realized that neither he or i knew how to tie a tie. i panicked & he googled it. ha. we went thru the video a few times & we couldn’t seem to get it to work. i snapped a few pics & then Emily was in the driveway. she got out of her car & was walking up to the open front door & she actually took my breathe away, she looked so pretty. i turned to jarred & said “wow jarred, she looks so beautiful” he said, “i know” very quietly. i knew then that he was nervous, very nervous. i called shane but there was nothing he could do over the phone & he said we should call papa but it was too late for that. we watched the video & followed each step, again & this time we got it & he looked so handsome. so handsome. it is a strange thing watching your baby have his first ‘real’ girlfriend. it is pretty special to watch how he treats her & listen to the things that he says to her. he is sweet. i just pray that we have brought him up to be respectful, to listen, to smile & have fun & to again, be respectful. i tried to not get caught up in this whole moment because it wasn’t about me it was about jarred but i think that is why this moment touched me so deeply. because it was about jarred. i know that shane wanted to be here for this but he works so hard so that i can be here for moments like this. but really, sometimes you just need your dad. shane has raised jarred, shane is jarred’s dad that is here for him every day, whatever he needs, shane is always there for him. jarred knows this & i have seen them grow so much closer in the past few years. it is so important for jarred to have such an amazing man to turn to & to call his dad & to know that he is his dad. always there for him. unconditionally. i am so very thankful that jarred has that in shane. even still, in these moments i know that jarred thinks about David & wishes he were here. i wish he was here just to see what an amazing human being that jarred is. i have never lost a parent, i have always had the love & support from my parents & when i got older i also had the love & support from their spouses. i have never cried because i couldn’t remember the sound of my parent’s voice. shane & i have watched jarred grieve the loss of his father his whole life & it is not something we dwell on but it is something that we are open about & as jarred has gotten older i have answered any questions that he has had the best that i could. this moment got to me because i just pray that jarred knows how truly proud of him David would be. i think it is something that we have to be open about. we are a blended family, no matter how much we don’t think of ourselves as that the reality is, we are. blended or not i think that we have done the best that we possibly could. i know this is dorky, but i am proud of shane & i for that. of course going thru this with jarred made me think of my nephew. but just as jarred has shane Anthony has mike. the fact that Mike is such an awesome, great man made it harder at first to see him with the kids. then i realized i wasn’t sad because they had a man in their life that will love them unconditionally, i was sad because it wasn’t my brother. it took me a little bit to realize that he was never coming back, he would never be the man tying Anthony’s tie for prom. but unlike then, now i can be thankful for mike. i can be so very thankful that they have him. it was very strange, on sunday i went to target & i cried the whole way there just thinking about my nieces & nephew & tony & then when i got there as soon as i stepped out of the car i saw mike & Anthony. sometimes i run into kera & the kids at the store but never just mike & Anthony. i can’t even put into words the peace that i felt when i saw them. i felt better. i told my mom about it later that day & she said that tony had sent them there to show me that Anthony was ok. mike is there for him & that is a good thing. im sorry if you are still reading my babbling, i guess it just feels good to get it out. i really want jarred to have my thoughts here to look back on later. so he knows that it wasn’t lost on me. life is good. life is hard. life is crazy. life is beautiful.